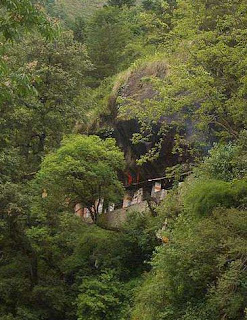 Kalpeshwar is the last temple in the list of Panch Kedar pilgrimage circuit. It is the only temple of the sacred Panch Kedar that remains opened throughout the year. Lord Shiva is worshipped in the form of matted hair at Kalpeshwar. The trail goes through thick forest and lush green terrace fields. An old Kalpriksha tree is famous with the sages and it is also known as fulfilling tree. Kalpeshwar is situated at an altitude of 2,134 mts above sea level near Urgam Valley in Chamoli district of Uttarakhand state. Kalpeshwar can be reached by an easy trek of 11 km starting from Helang. The captivating Urgam valley can be reached after a trek of 9 kms from Helang. There are two routes from Urgam Valley one ending up at Kalpeshwar and other going to Panar and Rudranath via Dumak. Kalpeshwar is the fifth temple in the series of holy Panch Kedar. After killing their cousins at the war, Pandavas started their journey to visit Lord Shiva to wash their sins. Lord Shiva wanted to avoid them as he was deeply incensed by the death and dishonesty at the Kurukshetra war. Therefore, he disguised in the form of a bull (Nandi) and disappeared into the ground with different parts of the body appearing at various places. Lord Shiva is worshipped in the form of matted hair at Kalpeshwar. Kalpeshwar can be reached by 11 kms trek from Helang. The trek to Kalpeshwar is graded easy. Helang is situated at an elevation of 1,295 mts above sea level. Follow the route to Urgam Valley and 2 km trek from Urgam valley will bring you to the holy shrine of Lord Shiva, Kalpeshwar. Home stay accommodation options are available at Kalpeshwar. You can also stay at the temple dharamshala. Accommodation options are available at Helang. While traveling to Kalpeshwar you can explore the Urgam valley. If you re willing to explore more, then you can travel to Rudranath by following the second route from Urgam Valley. A further visit to Joshimath and Auli is preferred. Both Auli and Joshimath are well connected by motorable roads. Kalpeshwar India travel guide with latest information of Kalpeshwar trekking Tourism. Kalpeshwar temple of Lord Shiva is part of the famous Panch Kedar. Best deals in Kalpeshwar trek tours travel packages, Plan your Kalpeshwar trekking trip with eUttaranchal in Uttarakhand India.